Frugal and Thankful: January Low/No Spend challenge, week 3. January Low/No Spend challenge, week 3. 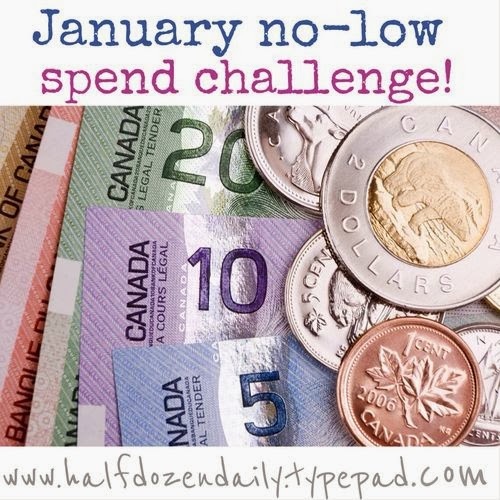 Since I went to do a teeny-tiny shopping trip today (and because it's been more then a week), I thought it was time to update on January Low/No spend challenge. I'm actually surprised but this month wasn't too bad financially for us. We had a lot of challenges in January but I managed to stay more or less in our budget so far. You might remember that I mentioned last week that we only had $25 left in our grocery budget. Well, we are down to $11 and change but I think, it's pretty good. I doubt I can make it with just $11 left but I should be pretty close to my goal. We are up to 8 no-spend days this month too, and with more than a week left until the end of the month, we are right on track to get this number to 12. We also finally figured out all of our medical bills. We got the doctor's bill that was $352 last week. Crazy that they charge you more for the doc just peeking in your room for 10 seconds than all of the facility charges (that include all the hard work the nurses do...). So we gave them a call to see if we could lower it a bit. The first guy Hubby talked to was not very responsive. He told him that since we are not unemployed any more, there is nothing they could do for us. After going back and forth and beating around the bush, hubs finally asked for a supervisor who was much more interested in helping us out. Apparently, they have a program to help people like us but they will never tell you about it unless you talk to somebody higher up. So they lowered it to $240. But since we got a reimbursement check this week too, it's almost a wash. So we sent out the last check and, hopefully, we can finally move on from it!! And with that reimbursement we only ended up paying $20 extra on this bill, so we should be able to put a nice chunk of money into our savings. I've been working really hard this month on my part-time job and should make at least $500 by the end of the month, and it will all go into savings, I hope. Did you participate in this challenge? How is January treating you? Lena you never cease to amaze me. We have the same thing at our hospital and I always encourage people to use it. They do ask them to send in a paystub but it does help so many people. And I know its crazy what a doctor can bill for a two minute visit. I remember when I had youngest DD I sent one of the doctors 10.00 a month for almost 2 years because it was all I could afford. His office hated it but I figured at least I was paying them so they just kept cashing the checks. We have a similar thing here in Ohio...and at our local hospital and urgent care, they ask you to fill out the paperwork when you register. The last time Bill was at the hospital for what we thought was a heart attack and for his follow up stress test, they ended up writing it all off based on our income. It was such a blessing. Glad to hear you were able to have your bill adjusted, Lena... makes you wonder how much they must overcharge to begin with! I agree with the others well done. You guys are doing so good. It pays to ask doesn't it? You are truly amazing Lena! I am sure your husband rises up and calls you blessed! Nice to know that you can ask to have a hospital bill lowered! So very glad that you were able to cover the bill and still be able to save! You are doing great this month!